Leslie George Jordan was born in England to Rose Davis and Canadian John Brown Jordan. His Father John had served in WWI and it is likely during this time that he met Rose, who was a WWI widow of John Peters. Before marrying Rose, John would first have to divorce his Canadian wife, no record of the divorce has been found. After WWI John worked in England for the Imperial War Graves Association, in 1921 his son Leslie was born. Leslie grew up in England and it is possible that did not meet his Canadian 1/2 brother and sister, Syd & Bea. At the outbreak of WWII it is not surprising that Leslie signed up, he became a Flight Sergeant Observer with 108 Squadron. In 1942 Leslie was in Egypt where he and others had the task of bringing Liberator AL577 plane to England. The plane left on March 15th with nineteen men onboard, the flight was going well until they encountered a storm. Liberator A577 crashed near Dundalk, Ireland killing fourteen people, Leslie was amoung the dead. Most of the information about Liberator AL577 was found on the site WWIINI Archives and Foreign Aircraft Landings in Ireland – WWII. Leslie is Remembered with Honour on the Brighton (Downs) Crematorium. I found a tribute video on Youtube for the people killed on AL577, but I was sad to see they, like me, did not have a photograph of Leslie. Leslie’s parents returned to Canada where his father John passed away in 1958 and was buried at Cataraquai Cemetery in Kingston, Ontario, his mother Rose Emma Mathews Davis died in England in 1979. My next step is to try and track down the people mentioned in Rose’s will in the hopes of finding a photograph of Leslie. *Featured Image from Wikimedia Commons of 36th Bombardment Squadron B-24 Liberator in Adak Alaska. My Diver / Dever family had a harrowing journey on the Doctor Kane from Londonderry, Ireland to Quebec in 1862. The ship they were sailing on set out in April of 1862 and struck ice leaving them stuck for an hour. This event was long before the Titanic but I am sure the passengers would have had horror stories of boat tragedies involving ice. It must have been a very long hour! Thankfully they were able to get free and reach their destination of Quebec. We the undersigned passengers of the Bark Dr. Kane, beg to present to you out sincere thanks, for your kin attention to us in administering to our wants and diffusing comforts to the utmost limits of thy power. Also, the deep interest you took of the sick, in prescribing “Medicine,” most suitable to their several distinct illnesses, thereby promoting health onboard. We unanimously have a deep gratification in being able to pronounce that thy kindess has far exceeded our expectations. And, also we cannot pass over the great deliverance we had on Saturday, 3rd May at three o’clock, AM, when our Bark struck fast into the field of ice. Through God’s most providential protection, we now retain and owe our lives, and thy surpassaple skill in able Commandership, in extracating us out of our perilous situation, in the short period of one hour, likewise, thy personal skill has been most obvious in taking every advantage of the wind, disregarding fatigue and inclemency of the weather. We all feel general satisfaction in our short voyage of thirty days, uniting again in thanks to God, and your exertions in being about to disembark at our desired haven, Quebec. A reply was penned but it was cut off from the clipping. I have added acquiring this to my to-do list. My Diver / Dever consisting of James, his wife Sarah (Cheatley) and their two children Eliza (age 4) and Samuel (2 mos. ), did not remain in Quebec but settled in Picton, Prince Edward Co., Ontario. I remember listening to a genealogy speaker who said there are always three brothers…I have found three such brothers – Cornelius, Edward and Michael McMahon. But I found an unknown fourth brother and I have discovered why none of us knew about #4. Researching my McMahon family has been amazing, I have connected with family members who have shared pictures, family stories, and information. The McMahon’s knew there were three brothers that immigrated to Canada until I came along and found out more. Brother number four, John McMahon, appears in the 1861 census living with his oldest Cornelius, his wife and children. This census does not include family relationships which meant it took a little more research to figure out the family connections. John next shows up living with brother Edward’s family in the three subsequent census’s for Normanby, Grey Co., Ontario. And if you scroll all the way over on the 1871 census for Canada you will find a heading, Deaf & Dumb, and a tick mark on the box for John. And no, that is not the reason the family forgot about John. 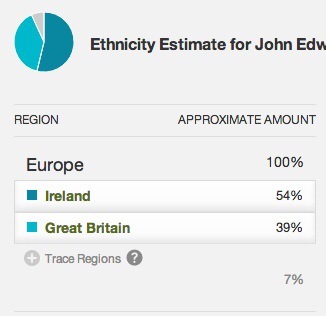 What we have learned is that John was born in 1846 in Ireland and the McMahon family left a few years later. John’s mother died on the journey over, or once the family arrived in Canada according to accounts passed down through the family. Life must not have been easy to be a deaf mute in that time. John was considered quite intelligent and used sign to communicate. It was probably a big help to his brother Edward having another grown man and an extra set of hands to help out on the farm. Records from the Archives of Ontario have uncovered more about John’s story. A search on their website for “John McMahon” did not bring in any answers but when I did a search for “McMahon, John” I was led to a page that had a record for a John McMahon being charged with wounding with intent in Grey Co. In 1894 things turned ugly in the McMahon house. A later account tells of how things had been escalating the last few years. John had started attacking his brother Edward and some of Edward’s children for no apparent reason. It all came to a head when John grabbed a block of wood from the wood pile and hit his brother Edward over the head when his back was turned. Edward’s wife Bridget intervened when she heard Edward call out. Edward survived the attack but had had enough with the erratic behavior and was concerned for the well-being for his family and called the local police. John was placed under arrest and was assessed by a doctor. He was declared not insane. I know John was sent to jail but I was unsure what happened to him. More information on John was discovered through Michael Stephenson’s Ontario and Upper Canada Genealogy and History site. Michael has created numerous indexes to not-so-common Ontario resources. If you find a name in the index, Michael will look up the record and mail it to you for a fee. When I searched through the Hamilton Asylum index, a John McMahon appeared. I emailed Michael a request for the full record and I sent off the cheque to cover his look up fee, yesterday the record arrived in the mail. The record included a history of John’s behavior, a Doctors assessment, a second Doctors assessment, an entry from his date of admission, and entries explaining his behavior for the years 1895-1902, 1904 & 1907. Honestly, this is more information than I have on other family members during this time. The history explained the change in John’s behavior, it started in 1889 when he was struck on the head by a limb falling from a tree. This injury prompted a shift in his behavior, he started to become violent and easily agitated. He made threats and even attacked members of the family. He is found on the 1901, 1911 and 1921 censuses as a patient in this institution. He spent 31 years living out his life at the Asylum, where the fairly detailed records indicate he helped out in the bakery. It is also noted that he was tidy, healthy, quiet, cheerful, and a good worker. I found a photograph of the Asylum on the McMaster’s University website along with a wonderful explanation about the facility. John was involved in one incident that was noted in the records, in 1899 he wandered off (escaped?) but this was the month of December and he made it as far as Clappison’s Corner where he was found by a farmer and returned to the Asylum. He suffered severe frostbite and had to have his toe amputated and had facial paralysis for a time due to exposure. John died in the Asylum in 1925 at the age of 80, and likely none of the McMahon family knew of his passing. He is buried at the Holy Sepulchre Cemetery in East Flamborough, Wentworth Co., Ontario. So this time there were four brothers. If you think you have a relative that may have stayed at one of the institutions in Ontario the Ontario Archives gives a good description of the records they have on their website.